The Philadelphia Orchestra returned to Washington for its thirty-eighth appearance hosted by Washington Performing Arts Society. This concert, on Wednesday night at the Kennedy Center Concert Hall, turned out to be one of the highlights of the organization's season, not least because of a pleasing program focused on the early twentieth century. During the controversial tenure of its last permanent music director, Christoph Eschenbach, this highly esteemed orchestra saw its national status decline, sliding off the unofficial list of the American Big Five in the minds of many critics. Under Charles Dutoit, recently appointed Chief Conductor and Artistic Adviser while the orchestra searches for a new music director, the Philadelphians sounded like they have regained their footing. Perhaps the state of morale among the musicians, who apparently relate more comfortably to Dutoit and who have been assured of a fair and equal say in the appointment of the next music director, has improved and allowed the players to relax and focus their energies (even after agreeing to a major pay cut). Whatever the reason, they sound good. The first half of the concert was the Jean-Yves Thibaudet show, who gave his always stylish (wardrobe) and technically assured, if slightly frenetic sort of performance. First, it was Ravel's concerto for the left hand, which proved a vehicle for the orchestra to display a broad range of colors and textures, from the murky, rumbling opening in low strings, with the ominous moaning of the contrabassoon, to the amassing of vast sweeping panoramas of sound. Thibaudet played suavely, with a smoky tone in a duet with English horn and especially in the gossamer accompanying figures of the closing cadenza. Unfortunately, he tended to rush quite a bit, including ending in advance of the orchestra on the work's final flourish, but Dutoit and the orchestra were able to accommodate these fluctuations for the most part. Thibaudet returned with both hands, and possibly a couple extra fingers, for Liszt's empty-headed but barnstorming Totentanz, S. 126, a set of variations on the melody of the Dies Irae sequence. This sort of work -- excessive glissandi, faux-serious Bach-like counterpoint, ferocious double octaves -- can only work with the most theatrical sort of player, and Thibaudet fit the bill. My well-known and often-disputed aversion to Rachmaninov does not at all apply to his magnificent last work, Symphonic Dances, op. 45. Written for Eugene Ormandy and the Philadelphia Orchestra, it is a work of masterful orchestration and form, with only one slightly over-saccharine passage (in the third movement). 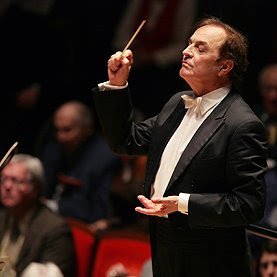 Dutoit, with the same clarity of gesture and thought shown in his NSO appearance earlier this year, etched the opening of the first movement with crispness, leading to a showcase of the orchestra's excellent woodwind soloists. The only exception to this impeccable level of performance (other than one noisy dropped percussion mallet) was the bluesy alto saxophone, often woefully out of tune, revealed when the piano and strings came back in, showing how much the other winds had adjusted. The ingenuity of the program created connections to the other works, in Rachmaninov's quotation of the Dies Irae (more subtle than Liszt's) and waltz second movement (more sultry and morose than Ravel's). The closing work, Ravel's La Valse, was a tour de force of virtuosity and ensemble cohesion, hewing so closely to every one of Dutoit's slight adjustments of tempo, dynamic, and attack. The exaggeration of glissandi and dynamic swells in the score created a boozy, tippling effect, making the work sound something like the soundtrack behind the sinking Titanic, as tuxedo-clad waiters continue to whisk trays of whiskey into luxurious suites. Sadly, the audience's response to this magnificent playing was to rush out the door into the rainy evening, preventing the possibility of an encore. The Philadelphia Orchestra will be back in Washington around this time next year (May 26, 2010, at Strathmore). Other visiting orchestras on the upcoming WPAS season include the New York Philharmonic (November 21, 2009), the Vienna Chamber Orchestra (November 22, 2009), the Royal Concertgebouw Orchestra (February 15, 2010), the San Francisco Symphony (March 24, 2010), and the Los Angeles Philharmonic (May 17, 2010). Pianists not to miss on the schedule are Murray Perahia (October 17, 2009), Leif Ove Andsnes (November 20, 2009), Angela Hewitt (December 3, 2009), Radu Lupu (January 27, 2010), Rafal Blechacz (February 27, 2010), Maurizio Pollini (April 15, 2010), Mitsuko Uchida (April 21, 2010), and Yuja Wang (May 22, 2010). Also of greatest interest are concerts by the Ebène Quartet (February 23, 2010), Julia Fischer playing Bach (April 3, 2010), and the Takács String Quartet (April 16, 2010).